(Nanowerk News) Biomedical engineers have developed a way to deliver drugs to specific types of neurons in the brain, providing an unprecedented ability to study neurological diseases while also promising a more targeted way to treat them. A new method named DART (Drugs Acutely Restricted by Tethering) may overcome these limitations. Developed by researchers at Duke University and the Howard Hughes Medical Institute, DART offers researchers the first opportunity to test what happens when a drug is targeted exclusively to one cell type. In its inaugural study, DART reveals how movement difficulties in a mouse model of Parkinson's Disease are controlled by the AMPA receptor (AMPAR) -- a synaptic protein that enables neurons to receive fast incoming signals from other neurons in the brain. The results reveal why a recent clinical trial of an AMPAR-blocking drug failed, and offer a new approach to using the pharmaceutical. The paper appeared online on April 7, 2017 in the journal Science ("Deconstructing behavioral neuropharmacology with cellular specificity"). "This study marks a major milestone in behavioral neuropharmacology," said Michael Tadross, assistant professor of biomedical engineering, who is in the process of moving his laboratory from the HHMI Janelia Research Campus to Duke. "The insights we gained in studying Parkinson's mice were unexpected and could not have been obtained with any previous method." In an experiment using a mouse model of Parkinson's disease, Tadross and colleagues attached the homing signal beacon to two types of neurons found in the basal ganglia -- the region of the brain responsible for motor control. One type, referred to as D1 neurons, are believed to give a "go" command. The other, referred to as D2 neurons, are thought to do just the opposite, providing commands to stop movements. Using DART, Tadross delivered an AMPAR-blocking pharmaceutical to only D1-neurons, only D2-neurons, or both. When delivered to both cell types simultaneously, the drugs improved only one of several components of motor dysfunction -- mirroring the lackluster results of recent human clinical trials. The team then found that delivering the drug to only the D1/"go" neurons did absolutely nothing. Surprisingly, however, by targeting the same drug to D2/"stop" neurons, the mice's movements became more frequent, faster, fluid and linear -- in other words, much closer to normal. While the drug stops neurons from receiving certain incoming signals, it does not completely shut them down. This nuance is particularly important for a subset of the D2 neurons that have two prominent forms of firing. With DART, these components could be separately manipulated, providing the first evidence that Parkinson's motor deficits are attributable to the AMPAR-based component of firing in these cells. Tadross said this level of nuance could not have been obtained with prior cell type-specific methods that completely shut neurons down. A look at the DART system in action, which can deliver drugs to specific cell types - in this case, neurons. 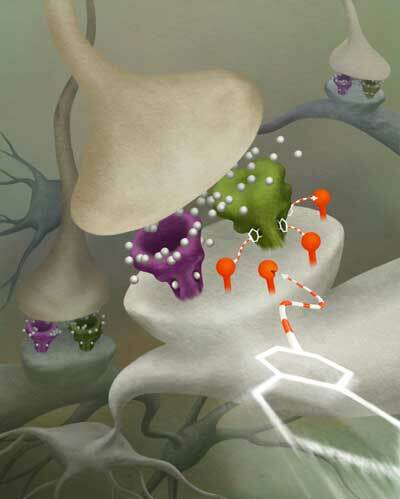 The neuron on the right with the DART beacon is accumulating drugs that effectively stop it from responding to synaptic inputs. Meanwhile, the drugs leave the neuron on the left, which has not been targeted by DART, alone. "Already in our first use of DART, we've learned something new about the synaptic basis of circuit dysfunction in Parkinson's disease," said Tadross. "We've discovered that targeting a specific receptor on specific types of neurons can lead to surprisingly potent improvements." Tadross is already looking into how this discovery might translate into a new therapy by delivering drugs to these neurons through an emerging viral technique. He is also beginning work to develop a version of DART that does not need the genetically added homing beacon to work. Both efforts will require years of research before seeing fruition -- but that's not stopping Tadross. "All too often in basic science, approaches are developed that may 'one day' make a difference to human health," he said. "At Duke, there's a palpable emphasis on providing new treatments to people as quickly as possible. I'm very excited that in this environment, my lab can work collaboratively with scientists, physicians, and biotech to solve the real-world challenges involved."